A man on a mochokid mission, Richard Broadbent enthuses over this months featured species. This species is relatively easy to identify, (albeit it is seen in the trade far less frequently than ten years ago). Key identity features include the very large eyes set far apart on the broad head. The body colouration can be extremely variable ranging from greyish yellow to pale brown or drab olive with even greater variation in body markings such as mottling, vague spotting or stripes but there will always be dark longitudinal caudal fin lobe stripes in the large sickle-shaped tail. As is usual with riverine Synodontis, juveniles are more attractively patterned than adults. David Sands (in CotW Volume 2), records that juveniles have been offered for sale as S. flavitaeniatus, which at the time was a rare and expensive species. Thankfully there should be no confusion currently and prices are roughly similar for these species nowadays. The mouth is small in comparison to other species which have similar adult sizes 325mm TL with a very small adipose fin. The humeral process is short, wide and blunt. 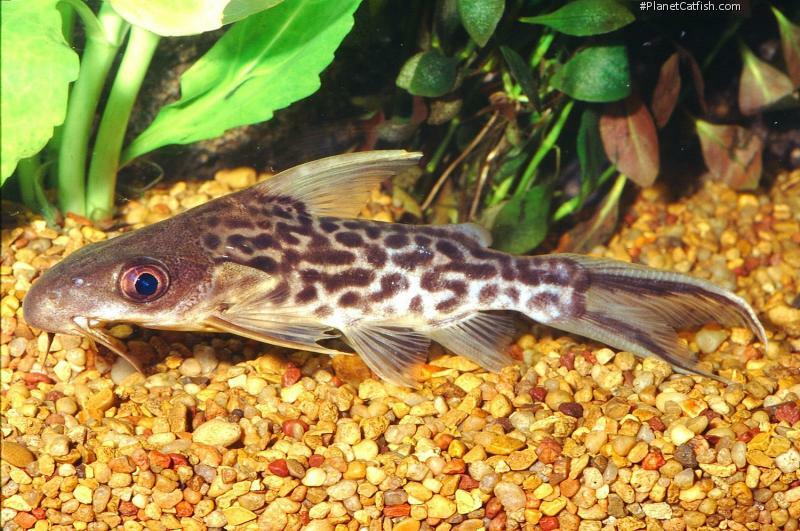 Within the last year this species has been available in the UK on a number of occasions at 2” SL and hopefully it will remain available to catfish keepers as it is an excellent catfish to keep and a good introduction to the world of Synodontis. It is relatively unfussy as to water conditions and will eagerly consume a wide variety of foods. It can be kept with other cats & mixed synos with few problems - I have only heard about one incident of intra-syno aggression. In my experience, I have found it to be a true ‘gentle-giant’. It is a hardy fish but is delicate in its movement and feeding unlike a lot of other synos. Many times I have watched mine slowly trace its path along the edge of a rock, daintily nibbling at algae or consuming the tiniest morsel: slow and precise with effortless grace. Tank set-ups are not difficult; standard rockwork or bogwood for concealment, some open space for swimming - a 48x15x18 would be ideal, maybe with a shoal of congo, alestes or brycinus tetras. Winkelmann (2001) succeeded in breeding S. pleurops but I can find no further documented accounts. Pictures of larval development can be seen in the excellent Seegars, “The Catfishes of Africa” book. Clearly there is further opportunity for a dedicated hobbyist with this species. In summation, this definitely a species I'd have no hestiation in recommending if you have the opportunity. Type Locality Stanley [Boyoma] Falls, Upper Congo R., Zaire. A very distinctive Synodontis easily identified by its large head, large eyes, relatively long, highly forked tail and dainty little mouth. The basic colour pattern is silvery white overlaid with brown-black markings, but there is considerable variation between individuals. Some specimens are spotted while others are striped. The distinctive markings of juveniles fade somewhat in adults. Other Parameters More tolerant of slightly acidic pH than many other Synodontis species. Feeding Omnivorous, but more interested in algae and vegetable matter than meat. Tends to be out-competed for food if kept in the company of more aggressive Synodontis species. Furniture Ample hiding places should be provided. The fish likes to cling to the sides of the aquarium rather than lying on the substrate, so dense Vallisneria and tall driftwood are to be recommended. Compatibility A peaceful, somewhat skittish fish that can nevertheless hold its own in boisterous company. Breeding Not reported in the aquarium.